Until the lions are taught to write, history will always be written by the hunters'. In the early planning stages of Freedom Park Robin Binckes participated as a member of the history subcommittee. The amount of debate and argument, much of it heated, astounded him. Practically every event discussed was interpreted from diametrically differing viewpoints. One of the most controversial topics was the Great Trek, the 1836 Boer exodus from the Cape Colony. Traditionally writers on the subject have covered the event from a perspective not only of 'white history' but predominantly of 'Afrikaner history'. It has always been seen as 'an Afrikaner event'. It was anything but. 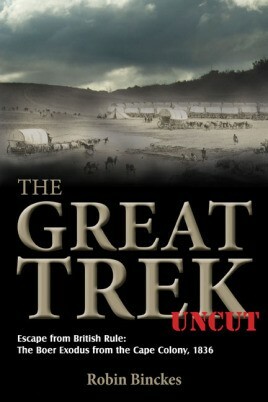 As the Great Trek and the events leading up to it involved every section of the population-Zulu, Sotho, Ndebele, Xhosa, Khoisan, Khoikhoi, Colored, British, English-speaking South African and Boer-it is time to portray the trek in that light, in the context of a unbiased, modern South Africa. Like most history the dots are all connected; it is impossible to separate the Great Trek from events which took place as far back as the Portuguese explorers because those early events shaped the backdrop to the causes of the Great Trek. Most writers have specialized in the trek itself whereas Binckes has adopted a broader approach that studies the impact of the earlier white incursions and migrations-Portuguese, Dutch, French and British-on southern Africa, to create a better understanding of the trek and its causes. Drawing heavily on eyewitness accounts wherever possible, he has consolidated these with the perspectives of leading historians, the final product being an objective and comprehensive record of one of the seminal events in South African history. This book shows that the Afrikaner was, is, and always will be, an important player in South African society, but it shows him as part of a bigger picture. The author distances himself from the noble characters stereotyped for the past two centuries and portrays them in their true light: wonderful, courageous people with human feelings, strengths and failings. Robin Binckes was born in East Griqualand, South Africa in April 1941. After matriculating in Umtata, Transkei, he did his national service at the South African Navy Gymnasium, Saldanha Bay. In 1970 he opened his own PR company to promote major sporting events ranging from international cricket to Formula One Grand Prix during the period of sports isolation. In 1990 he started The Gansbaai Fishing Company and spent ten years in the food industry. During the violence that swept South Africa in 1993 he volunteered as a peace monitor in the townships. Sparked by the passion of the late historical orator David Rattray, he qualified in 2002 as a historical tour guide, conducting tours in the Johannesburg-Pretoria region through his company 'Spear of the Nation'. His first book, Canvas under the Sky, a best-selling novel on the Great Trek, was published in 2011 and continues to fuel lively debate.